40 You're invited to Wikipedia Takes St. Louis! In the news: Public relations on Wikipedia: friend or foe? The parent Christianity WikiProject currently has 336 active members. We would like to welcome User:Emilymadcat, User:Toa Nidhiki05, User:DonutGuy, and User:RCNesland, Thank you all for your interest in this effort. If any members, new or not, wish any assistance, they should feel free to leave a message at the Christianity noticeboard or with me or other individual editors to request it. Thie coming month (mid-July through mid-September) includes days dedicated to the honor of Mary Magdalene, James, son of Zebedee, Ignatius Loyola, Saint Dominic, Joseph of Arimathea, and the Transfiguration of Jesus. Grade I listed churches in Cheshire was recently promoted to Featured List status. This picture was recently promoted to Featured Picture status. Bartolome de las Casas and Edmund the Martyr were promoted to GA level this past month. Our thanks and congratulations to all those involved. Wikibooks welcomes the development of textbooks of all kinds, children's books, recipes, and other material. It currently has just under 2500 books, including several Wikijunior books for the 12 and under population. There is, at present, not even a book on Christianity. Anyone interested in helping develop such a textbook is more than welcome to do so. 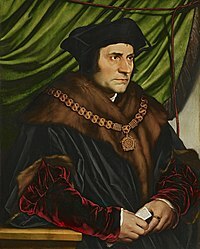 The portrait of Sir Thomas More by Hans Holbein the Younger. A new WikiProject relating directly to Christian history is being developed at Wikipedia:WikiProject Christian history. Anyone interested in assisting with the development of these groups and topics is more than welcome to do so. ... in the tradition of Thomas the Apostle, Mar Addai, and Saint Bartholomew. I believe that Jesus had two essences (or natures), human and divine, unmingled, that are everlastingly united in one personality. I am a member of the Assyrian Church of the East. Featured content: When is an island not an island? Featured content: Enough for a week – but I'm damned if I see how the helican. Technology report: Just how bad is the code review backlog? You're invited to Wikipedia Takes St. Louis! Technology report: Time for a MediaWiki Foundation? News and notes: Researchers find that Simple English Wikipedia has "lost its focus"